We have an event horse!!!! I can&apos;t stop smiling. I can&apos;t believe what horse I had under me this morning. All the details to come but for now…. As I get ready to embark on my first cross country outing tomorrow, it occurs to me that I do not own a vest. Trainer is lending me one for the schooling day, but if all goes well and we manage to not die on our first outing I will eventually be needing my own. I’ve done some preliminary research because who doesn’t hate that person who goes online to ask a question they could have just googled instead. Or is that just me? Anyway… I’ve read about the difference between the BETA and ASTM requirements and have looked up lists of available vests on the market today. This just made my head spin. From what I have read and the little I have seen out and about, I have gathered a very short list of things I know I want and the rest is so up in the air that I am taking to the blog to ask all you for suggestions on where to even begin. The big issue I have is that the local tack shop only carries the Tipperary ASTM certified vest and that goes against one of the items on my list, so I can’t go try on bunch and see what I like. The AECs aare back in Tryon next month and I have signed up to volunteer two days. Last year they had a small vendor area and I am hoping it returns as well. If I can get some good opinions here then I can go armed with some info to try on as many brands as I can get my hands on. 5.) At least a little cool. It is so insanely hot and humid here that I worry most about heat stroke in a solid vest than how I look or what color the thing is. I know they will all be hotter than not wearing one (much like a helmet), but safety is more important. If I can find one that offers a little better heat dissipation that would be great. So…any pointers, tips, suggestions, recommendations? Please lay it on me so that I can go armed with information and ready to try on all the things. Waggy Tails has settled right into life at our house. I keep telling Dusty that she is going to be one excellent dog when she is grown up as I keep seeing little snippets of her personality come to life. Super Wags to the rescue!!! For starters, she is wicked smart. I thought I was getting a big, dumb dog, but instead I have a likeness closer to my Corgi, Hero. In fact, there are so many times that I see her out of the corner of my eye and think I see Hero looking back at me. It is a flash back to older times and one I didn’t realize I missed so darn much. She learned her name in under 24 hours, mostly has the whole house training thing down with only a few puppy mishaps when I can’t get to her quick enough, and has begun work on sit and come. I am waiting on stay for a while yet as she is only 9 weeks old. Lazy puppy chilling with me at work. In general, she is a very lazy pup. I’ve been spoiled in the past with high energy dogs, but specifically wanted a more chilled out breed with our busy work and non dog approved life schedules. She has about an hour to an hour and a half of play time in the morning that result sin full blown passed out puppy napping until dinner. Even when she is awake, she prefers to sit or lay down to play. Eating while laying down. Gotta save those calories for growing. I finally managed to convince her that it was a good idea to walk to the horse pasture this past weekend. The hubby is already having flashbacks to the attitude of Hero and just shakes his head when he asks her to come along outside with him and instead she sits, looks at him, looks back at the house and saunters back to the garage to ask to come inside. Waggy Tails refuses to use up any more energy than she absolutely must at any given time. In fact, she is sounding more and more Gem like to me as I type which does’t surprise me as I tend to gravitate towards that personality. She is absolutely perfect with Wyatt. She puts up with him carrying her around, wrestling and in general annoying the crap out of her. She has never run away from him, hid, or made a peep. Actually, she hasn’t made much noise the entire time we have had her. Wyatt adores her and I catch him often hugging her and telling her she is his best friend. In fact, she is pretty much amenable to everything. One of my biggest concerns with getting a puppy was the cats. Smokey is 14, Echo 8 and they really didn’t take to Einstein very well even though both have been around dogs their entire life. I don’t know if Waggy Tails puts off the right type of signal or if it is her laid back attitude, but both have taken to her immediately and I see no signs of any change in their personality, health, eating or daily routines. Waggy Tails has really been a blessing for our family. I had gone back and forth about it. Life is hectic enough with everything else going on that adding a puppy to the mix could have been a disaster. It may still be, but for now all that has happened in the addition of more love. In March 2010, the hubby looked over at me on the couch and asked when I was going to find him a haflinger. I paused for all of 20 seconds before jumping online for a very quick search which landed on a small add for a 10 year old Haflinger gelding. We drove down to meet him and two things were immediately evident: he was neither 10 years old nor a Haffy. It didn&apos;t matter though, the hubby was smitten and there was no way we weren&apos;t going home with him. Pete has been the perfect hubby horse. From day one, his personality just meshed super well with Dusty. 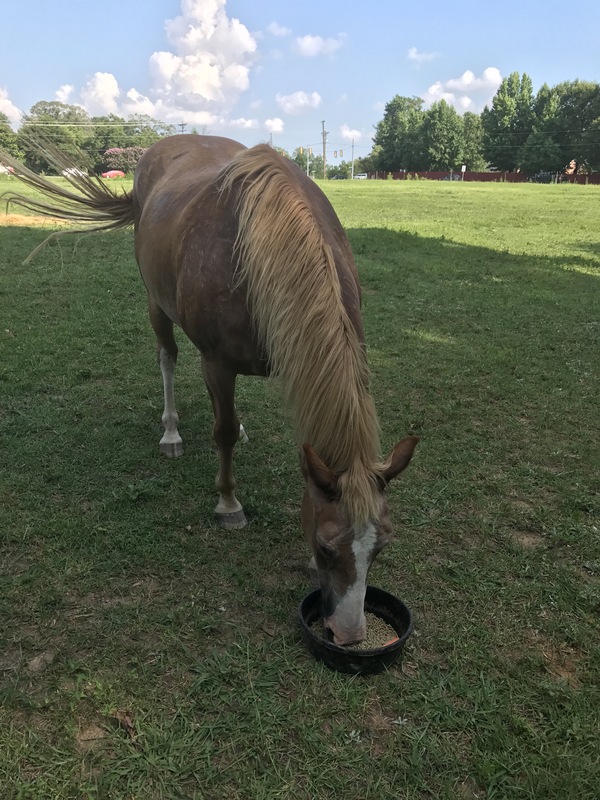 He has a can do attitude for all things under saddle and has taken Dusty on countless trail miles, swimming in the river, over stadium fences and along a cross country course. I&apos;ve never seen him say no to any challenge. On Dustys end of the relationship, he has come at Pete with a great sense of humor which has allowed Pete to blossom. When Pete decided he had no spine and was therefore incapable of bending, Dusty just laughed as they cantered sideways into a tree. When Pete froze in his tracks at the sight of a small butterfly and watched in amazement as it fluttered around for 5 minutes, Dusty chuckled and gave him a pat. I&apos;m not sure anyone else could have brought Pete out of his shell like Dusty did. Pete even went on an endurance ride with us. He thoroughly enjoyed the first 13 miles, but decided that was about enough for the day. He did manage to complete is last place though. Dusty rode Pete typically twice a week up until Wyatt was born and then it was once a week. Slowly over time it has continued to decrease. Prior to moving him home he hadn&apos;t had any work at all for 6 months and only a few rides total in a year. He didn&apos;t seem to mind though as he ballooned up to whale size and enjoyed playing in the field. Pasture life suits him well. He gets along with everyone and if he can convince his friends to go galloping around and bucking he will. Unfortunately Gem isn&apos;t one to waste energy and rarely gets kicked up into a frenzy. The goal has always been to get him back into work once he was brought home. He is 26 by best guess, but still frisky and perfectly sound. He has always loved exploring the trails and getting to stretch his legs. We actually felt pretty bad about his mostly retired status all these years and figured he would be happy to get back into the swing of things. Our first trail ride in June he was more than happy to get caught and waltzed onto the trailer. He had an enjoyable ride going at a pace he was comfortable with and we walked when he needed a break. The next time out he was harder to catch, but still loaded just fine and while he seemed putzy on trail he moved without hesitation. Well apparently Pete is calling enough enough and has declared that he much preferred his retirement status. Ever since his third, and now sadly final, ride back out of retirement he has made it perfectly loud and clear that he is unhappy. He is impossible to catch now and won&apos;t even let me halter him to spray him with fly spray. He always enjoyed scratches with his dinner and now he is giving me the hairy eye and making sure he stands just far enough out of reach that he can leave if a halter comes into view. I had him checked to make sure he is still pain free and healthy and he is. I mean I can watch him gallop full title around the pasture throwing in fun bucks and rears for fun. He isn&apos;t sore. He doesn&apos;t have ulcers. He wants his retirement back. Honestly at 26 he deserves his retirement back. We brought him out thinking he would be happier with a job but that is blatantly not true. So, Pete is now fully retired with no plans to bring him out again. His tack has been removed from the trailer and put into storage in the garage. I&apos;m a little sad to tell you the truth. Pete has a forever home with us though and he will be enjoying his retirement playing in the field. I already mentioned how above and beyond Trainer went to help me get the horses’ hooves trimmed. What I didn’t mention was that she also lent me a set of stirrups. 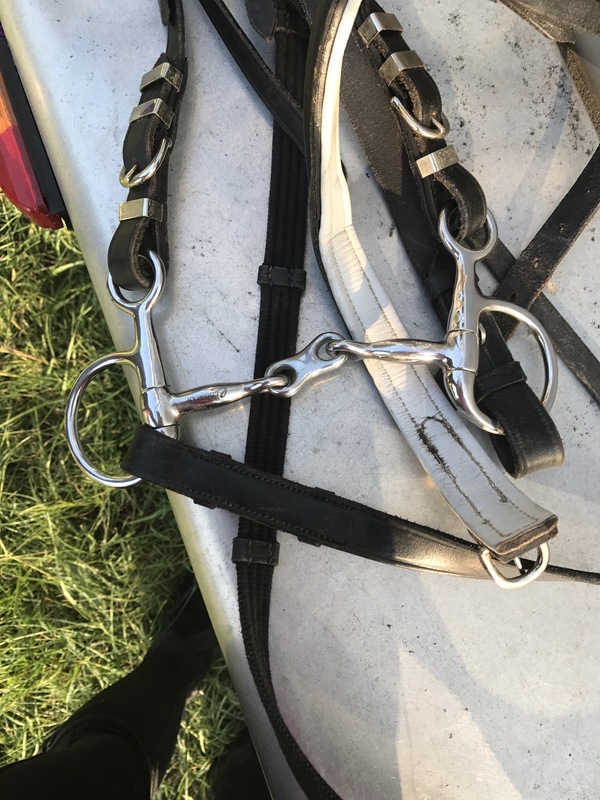 I had my endurance and dressage saddle in the trailer from the recent rides I had done and when I went to tack up I was sad to recall that my stirrups were nicely attached to the jump saddle back home. Trainer lent me hers no issue. Once I realized I was stirrupless I declared that it was high time I got a set of leathers and irons for my dressage saddle. I work hard and they aren’t that expensive. 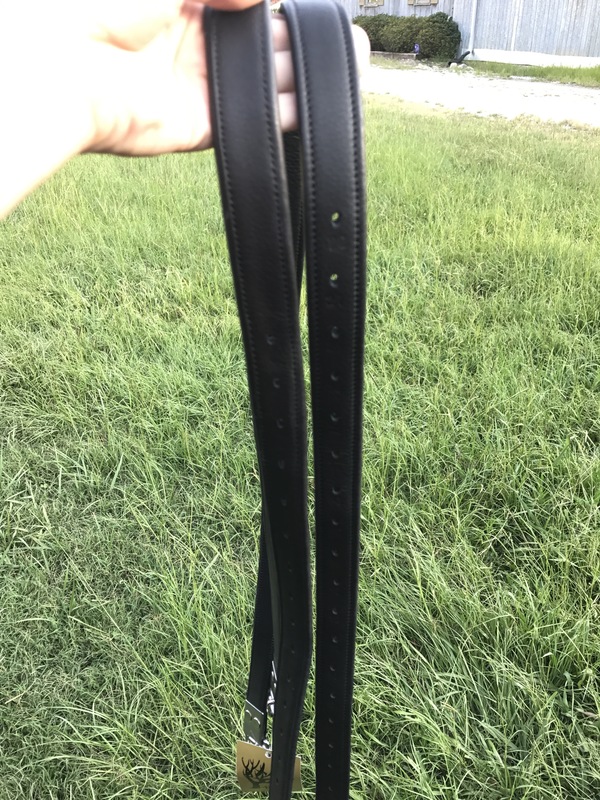 Having a set for each saddle would not only eliminate the issue of forgotten tack, but would also let me set them for my desired length and not have to constantly fiddle every time I switched saddles. So, Sunday afternoon I left the boys to themselves and headed to the tack store aimed at purchasing a set of black leathers. 5.) Lead Ropes x 2. 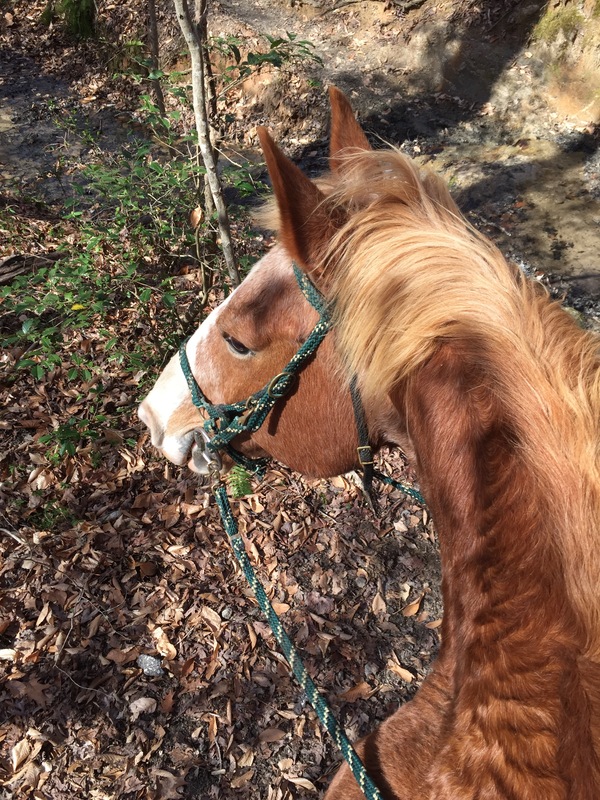 Pete has broken two lead ropes lately. One when he pulled back at the trailer and the other I snapped when I tried to pull it out from under his hoof. As I browsed the store, I threw these in my pile. 4.) Fly Spray. We ran out of the black Ultrashield and I wanted to try something oil based instead with hopes that it will last longer in the rain and sweat. I forgot to get a picture, but take my word for it that it looks like a bottle of fly spray. 3.) Stirrup leathers. I did actually purchase what I went in for. I have liked my Black Oak brown leathers quite a bit. Soft and padded yet sturdy. 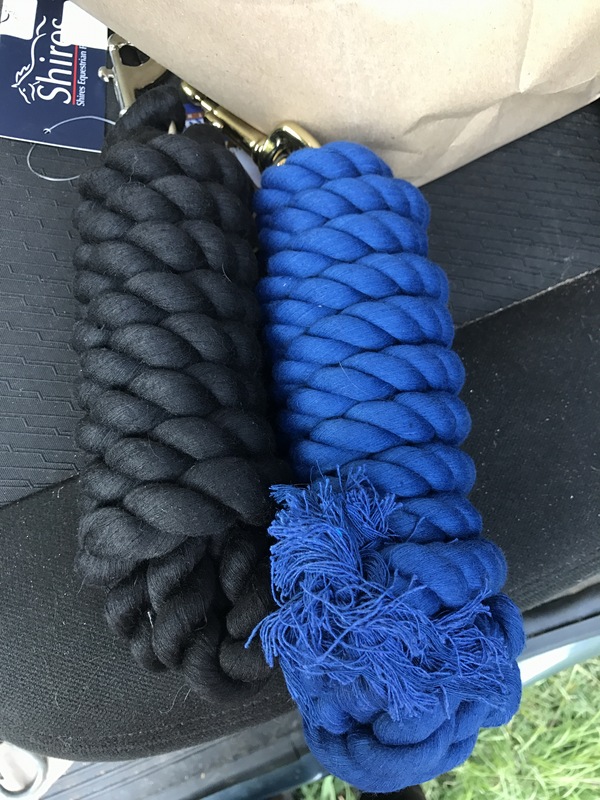 I found a set in black and snatched them up. I’ve really liked the ones I have for my jump saddle. They have taken the abuse of not only being adjusted for length every ride, but moved from saddle to saddle as well. 2.) Baucher bit. I can’t get out of the store without a look through the consignment section. This bit has been on my wish list for a long time. I put Gem in the full cheek 6 years ago on a whim and stuck with it. I’m not really a fan of it though even with bit keepers. I figured the Baucher would give her the stability she craves while still having somewhat of a full cheek effect for turning. At only $20 it was a risk I was willing to take. I rode her in it on Wednesday night and while the angels weren’t singing and magic didn’t happen, I also didn’t lose my breaks and she seemed pleasant and happy. 1.) 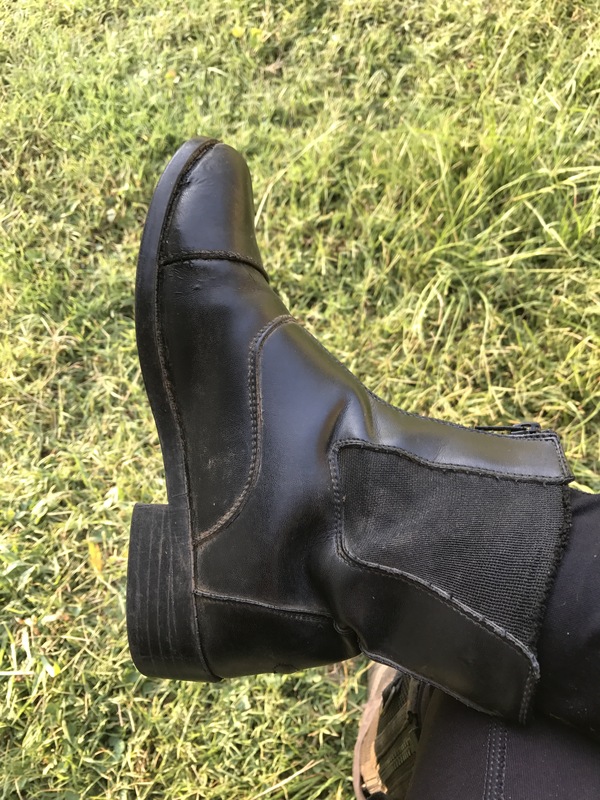 Paddock Boots. My favorite find of the day. I’ve been riding in Ariat tennis style riding shoes since 2007. Those shoes are well beyond broken down 10 years later and have started to be really painful to wear. Paddock boots are expensive though and I’m cheap. When I saw these beauties in my size I couldn’t pass them up. I’ve worn them now for a ride and absolutely adore them. They are so much better than my Ariats were even brand new. They look really cute with my half chaps as well and will be my new go to for schooling to save my tall boots for the shows. 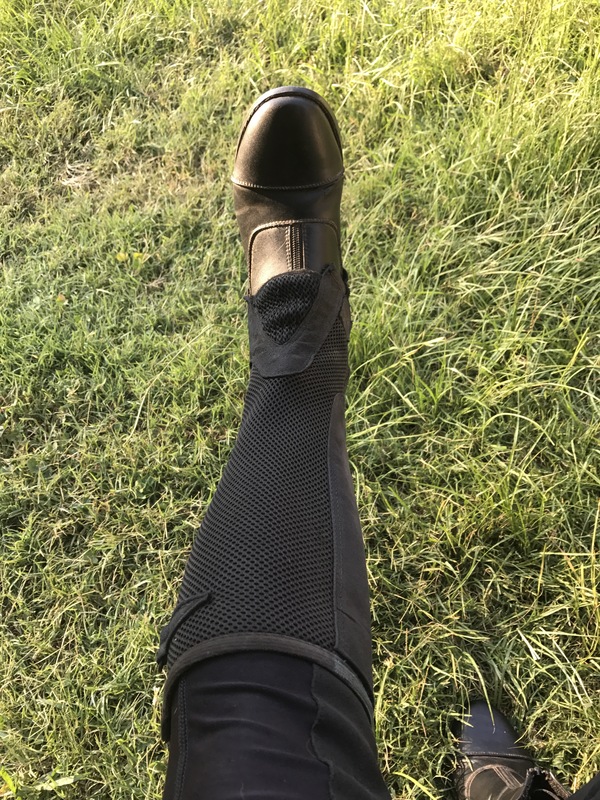 They are stretched out in the ankle but with half chaps on it isn’t even noticeable. At $15 there was no way I was going to pass these up. I love how they look. I’m starting to go over to the dark side of English riding little by little.